WordPress Version 4.9 is now available for you to update in your WordPress dashboard. On some installations, the update may have happened automatically. And on some, it’s a manual process. As usual, with every WordPress update, there’s a flurry of theme and plugin updates coming your way. Updates can sometimes break your website so it’s a good practice to always backup your website before updating. If your website is not too big then I recommend WP Clone. For a large website use a database backup plugin to back up the database and FTP to backup all your files and folders. Let’s hope this is enough to deter new WordPress users from breaking their websites. There’s a brand new gallery widget so now you can add multiple images to your sidebar. The appearance of the gallery depends on your site’s layout and sidebar width so you may have 2 or more images side by side. And now you can add media to your text widgets at the touch of a button. Embed images, video and audio directly into your text widgets. You have the usual alignment and linking options with the media. How cool is that? This version of WordPress has smoothed out the process of creating new menus so there’s less confusion. If you’re thinking about changing your website’s theme then you can use the Customizer. The Customizer shows your active theme and there’s a Change button to allow you to preview other themes by showing what the new theme will look like with your own content. Of course the theme filter is there to help you narrow down your search for the perfect theme. And when you change your theme there will be less disruption to your menus and widget placement thanks to this latest version of WordPress. Problems With the New Version of WordPress? All in all there are some pretty terrific improvements in WordPress Version 4.9. What do you like (or dislike) about WordPress Version 4.9? Your comments are always welcome. 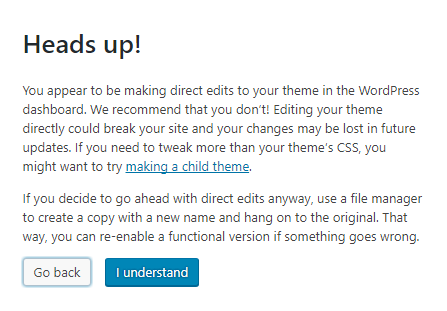 After we installed WordPress 4.9 it broke our Visual Builder, we could not edit any texts anymore. We could fix it quickly, the DB got corrupt. I really enjoyed your post on the WordPress Version 4.9 update. I just update as and when it needs to be done. However, reading your informative article Marion, this time, I will investigate it a little more. Make sure you do a full backup before any updates. I should have read your article just 3 days ago, hallelujah. Well, it went all well with our WordPress 4.9 update, but we have already a notification of 4.9.1, seems there are some minor issues which have been addressed. Yes, there’s just a couple of security issues that have been fixed in the new version. Thanks a bunch for this reminder. I followed your training on WA and installed WP Clone. But since deleting it after using it, I had a hard time recalling the name of the plugin that I had used to backup my website. Since using it about 4 months ago, I’ve been using only the Export tool to export my website content. Is the Export tool not enough to backup my site before any WordPress update? Sorry Princila, the Export tool will only create a text version of the content of your website so you won’t be able to roll back to a previous version of your site if it goes horribly wrong. WP Clone backs up everything including the WordPress version, theme version, media files and database. There’s no need to delete the plugin, you can just deactivate it until you want to use it again. One caution I have is to only keep the latest two backups on the server so you’re not taking up all the server’s storage capacity. Thanks for the heads up. I have alreadyy updated all my websites and played around with the new gallery feature. It is really fun. Thanks, Marion for this post it is really helpful in so many ways. I do back up my website with WP Clone, it is so easy to do. However, I have just one question would it be helpful to deactivate all the plugins before updating the website to avoid any problems. To re-activate one plugin at the should be a safer way, or perhaps I am totally wrong? That’s an interesting question Sylvia. I don’t usually deactivated any plugins before updating. In a worst case scenario I’ve had to do a complete re-installation of WordPress and then restore from a WP Clone backup to fix issues caused from updates. That’s when I would deactivate all the plugins before updating. Otherwise in most cases there’s no problem. This is great info, Marion !! Going to look at my theme and see how I can create a childs theme. Hoping what I already tweaked will be okay for future updates. I did not see a warning as I do now when I first went into my editor to change my footer. Is there a way for me to double check to be sure I didn’t do any damage? I am guilty of not backing up my site but you have given me good reason to believe backing up before each WP update is crucial. It’s likely you’ll lose the edits you made to your theme next time your theme updates so you’ll want to create a child theme for future tweaks. This video will show you the basics of creating a child theme. Thank you, Marion. I will need tutoring and I’m grateful you have the necessary videos for training newbies like myself! Hi Marion, thanks for an important reminder for me personally. Whenever WordPress has update, I’ll just pressed update. Never thought about back up my site! I’m going to back up my website first! Thanks for recommending WP clone. Will do tonight. Then will update wordPress 4.9. Will then checkout the widgets and menu. I do daily backups of my website to ensure that I always have something to fall back on if disaster strikes. It’s a good habit to get into Song, even if you only backup before doing the updates. Hi again, yeah, will remember to update regularly. For me, it’ll be, I guess, once a week for now, because that’s how often I post a new article. Have to remember, prevention is better than cure! Great post for your readers!